I'm up at Stupid O'Clock. Even now that the time change happened, I'm still up at Stupid O'Clock. You folks are doing something sensible like drooling into your pillow, snoring, and catching spiders with your mouth. But no, I'm up around two hours before sunrise walking my dog. This happens just about every day, rain or shine. I do try to wait out the storms since they usually are short and under a half hour, but normally I just soldier on through them. How can you tell a tourist in South Florida? We'll also say they don't know how to drive, but you'll argue until you see it yourself. Really, folks, a sign that indicates "No U Turn" means the same down here as it does in Lexington, Kentucky, and Toronto Canada as it does here in Metro Fort Lauderdale. But I am out with Rack, the McNab SuperDog (TM) wandering around town. He's watering palm trees and I'm on the look out for anything out of the ordinary. I'm convinced I need to bring a pen knife to remove some stickers on public spaces, and a bottle of Acetone to wipe down the graffiti that some low lifes have decided to "decorate" light poles around town. However, one thing popped up on the sidewalk the other day. We had a Halloween celebration last month. Great time for a party. Thousands of people enjoying being out together. Homes got decorated here, and some of them stayed decorated. 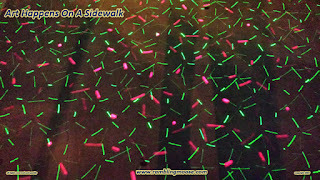 One of the balconies on Wilton Drive ended up with a laser display. These things showed up on the scene first a year or two ago. Put Stars on Your House! Home Laser Display! Amaze Your Friends. For the most part they ended up looking somewhat weak because of the repetitive nature of the displays but it was a nice change of pace from the over done gaudiness of holiday displays. People took them back in and put them in storage and even a few ended up at the thrift stores in January or February when nobody considered a need for them. But Halloween? They're just the ticket. These folks put their display up and turned it on directly below their balcony. 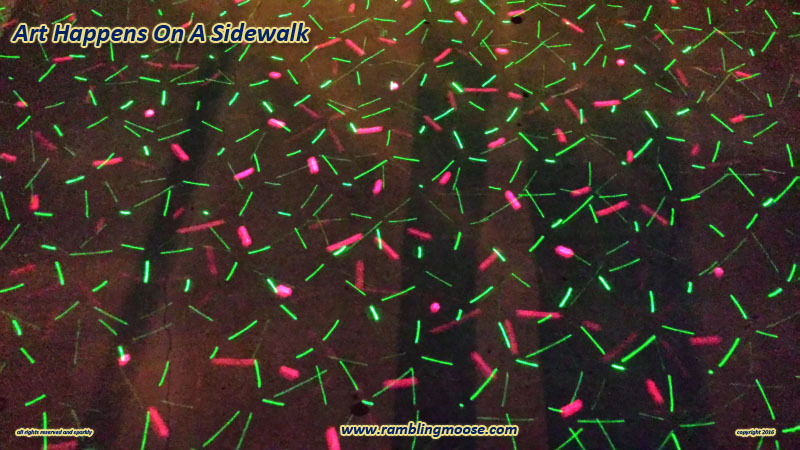 So at 5 AM, rain or shine, Rack and I walk through the red and green lasers and smile. They dance and make trails quickly on the ground for anyone to pass by. Now, not having the right equipment to take a professional picture of them is actually a benefit in this case. You see if it was timed right, all I would end up would be a field of dots. However the camera I used did not have a fast enough shutter in this case. Turned that display in to fireworks instead. So if you're in a light display, try it yourself. You never know where your picture will get an upgrade to Photography.